Photo Courtesy of The Texas Education Agency. 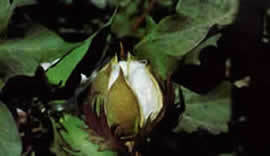 Cotton is a warm climate crop and so is grown only in the southern United States. "Cotton Belt" states include Virginia, North and South Carolina Georgia, Mississippi, Alabama, Louisiana, Arkansas, Florida, Tennessee, Missouri, Oklahoma, Kansas, Texas, New Mexico, Arizona, and California. The three leading cotton-growing states are Texas, California, and Georgia. In the nineteenth century, cotton was the basis of the southern agricultural economy. It was grown on large plantations where African-American slaves did most of the work of planting and picking the crop. Cotton remains a major crop in the South but largely machines do planting and harvesting. Click on MAPS below for additional facts about cotton.